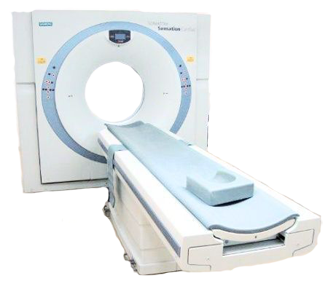 The Siemens Sensation 16 Slice CT is one of the most widely-used multi-slice, whole-body CT scanners on the market. With the ability to perform 3D whole body and cardiac exams with exceptional image quality, the Siemens Somatom Senation 16 is an excellent choice for imaging centers without the budget to buy new. The Siemens Sensation 16 allows you to conduct cardiac studies in less than 20 seconds with .75mm slice and down to 105 ms temporal resolution for clear depiction of the coronary arteries. Purchasing a refurbished, used Siemens Sensation 16 is an affordable way to extend the clinical capabilities of your clinic or department. Scan any anatomy within one breathhold with virtually isotropic resolution for clear visualization of anatomy/ pathology, seen from any perspective with the Siemens Somatom Sensation 16 slice CT scanner.